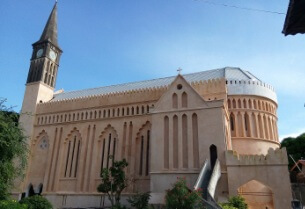 The ADZ, which is part of the Anglican Church of Tanzania, embarked on the cathedral refurbishing project on 1 October 2013 in partnership with World Monuments Fund Britain and announced in its July 2015 newsletter that efforts to raise its portion of grant funding had been successful. The cathedral’s planned Heritage and Education Centre will retell the story of the East African slave trade in a form accessible to school children, in both English and Kiswahili. The centre also intends to educate about modern-day realities, including the fact that there are now more slaves on the planet than at any previous time in history, with trafficking of women figuring as the world’s second largest industry, and that Zanzibar once again is serving as a trafficking point, especially of children. The ADZ aims to offer visitors concrete steps they can take to join in combating the crisis. Globally it is estimated that there are over 30 million victims of modern slavery. It is a priority for governments and faith communities throughout the world. On 2 December 2014, a historic meeting was held at the Vatican where faith leaders joined to commit together to work towards the ending of modern slavery. Convened by the Global Freedom Network, the declaration was signed by the Pope, the Archbishop of Canterbury and other global faith leaders. Archbishop Justin said faith leaders can make sure that every worshiping community knows about modern slavery and is ready to work to prevent and end such abuses. “As we make this solemn commitment today, my prayer is that we shall by God’s grace play a key role in ending the inhuman practices of modern slavery – practices that disfigure our world and obscure the image of God in men, women and children. We have the will, we have the common purpose, this can be done; may God bless our action together,” he said. The Zanzibar initiative continues a long Anglican tradition of advocating for the human right to freedom and dignity, notes Rachel Carnegie, Anglican Alliance Co-Executive Director. The Anglican Alliance is working to lift up such examples of local church action and to connect Anglicans with others within the Communion and beyond who are working to end modern slavery. “The Anglican Church played a key role in ending the trans-Atlantic slave trade and again today is called to work together with others to confront and end modern-day forms of slavery,” she says. “Ending human trafficking is one of the Anglican Alliance’s three global priorities,” she says. To that end the Anglican Alliance is providing a platform for Anglicans to share their skills, vision and research. A November 2014 global Anglican Alliance consultation and webinar on slavery looked at how churches and faith groups could work together to tackle the problem. Participants recommended mapping available resources and providing education on protection and prevention. “It’s important to connect churches and agencies who are working to stop modern-day slavery by sharing insights and building capacity so that we can respond more effectively,” Rachel says. Local education efforts such as the ADZ’s heritage and education centre are important to raise awareness of the problem to prevent the crime and enable swifter identification of those who have been trafficked, she points out. And housing the centre in a core place of worship of the Diocese underlines the fact that faith communities have a unique role to play in the response to modern slavery and human trafficking, she adds. Consultation participants pointed to the importance of having a spiritual anchoring for the Church’s work against trafficking and the way in which applying biblical principles could deepen understanding and engagement by local churches. The Zanzibar centre also aims to promote interfaith and inter-communal dialogue and understanding. The centre and its exhibits will be accessible for people living with disabilities, including tours in Sign Language.